Visiting Bandung without seeing the iconic building or its landmarks will certainly feel bland. But by visiting and capturing it with camera we can capture the feel of Bandung City soul. Well in the city of Bandung, Gedung Sate already becoming a landmark and iconic buildings that should not be missed during your visit to “Paris van Java”. Being in the city center, Gedung Sate itself is very popular not only for the people of Bandung, but also for the world community in general. Characteristic inherent and synonymous with Gedung Sate itself is the existence of 6 skewers ornaments located in the middle of the roof of the building. Six skewers itself symbolizes the funds used to build Gedung Sate which spent 6 million guilders. From this skewer ornament this building is called Gedung Sate. Gedung Sate itself is also one of the old and historic buildings in the city of Bandung. Because, the building that was formerly called Gouvernements Bedrijven (GB) was built starting in 1920 and completed in 1924. Although it is an heritage buildings, Gedung Sate is till standing firm. Even after Indonesia’s independence, precisely in the 1980s until now, Gedung Sate is functioned as the office of West Java governor. Because the building is the center of the activities of the Government of West Java Province iconic Gedung Sate gets the nickname ‘White House of Bandung’. As a tourist place, Gedung Sate is able to make anyone who visit it will be impressed. Therefore, this building in addition to having its own history, Gedung Sate is also very iconic and often used as spot photographed by the visitors. With the architecture of the Dutch building makes the Gedung Sate very interesting to watch or to be a spot photography. Not only look around and take pictures, some people who come here are also there who do filming or shooting for pre-wedding. Where Should You Go While Visit Northern Bandung? Not only witness from the outside, but in this Gedung Sate tour you can also go in and browse space by space. But if you want to get into Gedung Sate then you must first ask permission to the manager. When entering Gedung Sate then the first time you will encounter is a set of Sundanese gamelan. After a few steps then we will find spaces filled with office activities. Understandably Gedung Sate is an office area of ​​West Java Provincial Government. But when heading to the 4th floor then we will find a different atmosphere because there is a place that is used to entertain the guests of the country or special guests. On the 4th floor of Gedung Sate we can also enjoy the view of Bandung directly or with binoculars. In addition on the 4th floor we can also find a variety of souvenirs and inscriptions of West Java province and photos of the governor’s activities. The most crowded tourist visit to Gedung Sate is on Sunday. The management of Gedung Sate does open its place for public on weekends and holidays only. At the time of Gedung Sate in open to the public then the area around or rather in front of the building will also be crowded because of the existence of the market keget. For you who are interested to Gedung Sate then you have to go Jalan Diponegoro Number 22, Bandung. Because it is in the center of Bandung, there will be many transportation that can be chosen to take us to Gedung Sate. But because the state of Bandung is often jammed so that your vacation remains exciting needed a comfortable vehicle. The choice of private vehicle is the best option if you want to enjoy the holiday in Gedung Sate optimally. Because when using public transportation we know the quality is not maximized it will make the comfort level decreased. Unfortunately not everyone can bring his personal vehicle to the city of Bandung. Well if you are one person who is not possible to bring personal vehicle directly then you can use car rental services Bandung. With Bandung car rental then we can indeed feel the sensation of driving a private vehicle. One of Bandung car rental reference that professional and experienced that you can choose is Dirgantara Car Rental. With professionalism and experience that is owned then Dirgantara Car Rental will make your holiday to Gedung Sate will feel impressive. If you crave exciting and a whole complete tourist destinations in one place in Bandung then Dago Dream Park will be the right place. A new tour in the city of flowers is indeed interesting and become an alternative tourist attractions if you got bored with other attractions. With an area of ​​12 hectares of course Dago Dream Park is presenting a variety of exciting activities that can be done the visitors. This is because in Dago Dream Park there are various rides games and also other interesting activity. Some games that we can enjoy in Dago Dream Park is horse riding, bike sky, sky gliding, pirate ship, ATV, buggy-keretaan, boat row, archery, garden maze and anti-gravity. At least now there are about 20 rides games that tourists can enjoy at Dago Dream Park. In addition, some places like a mini zoo, fishing pond, tree house, kampoeng Dayang Sumbi, aquarium and amphi theater could also be a better activity for travelers while on vacation to Dago Dream Park. The latest game park at Dago Dream Park is also often a tourist destination. The newest rides at Dago Dream Park are similar flying houses in the movie “Up”. The second-terabru rides are also often targeted by tourists ie flying tapestry. Not only enjoy the sensation of home and flying rugs ride, but in both the rides you can take pictures that will produce a cool picture and Instagramable. Dago Dream Park tourist area which has an area of ​​12 hectares make you will be satisfied explore the area. Even see the location of Dago Dream Park located in a hill so it may be make you feel tired and tired of having to go up and down. But you do not have to worry if you want to explore Dago Dream Park as a whole. This is because it has provided bus bandros that you can ride for free. 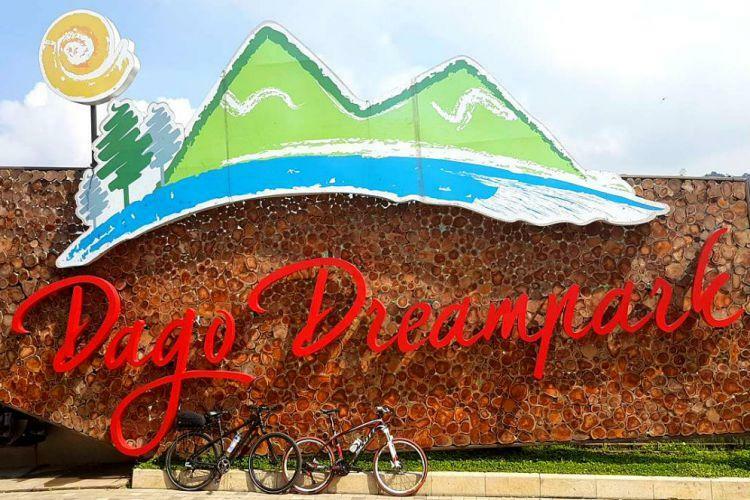 Dago Dream Park’s own extensive area is divided into several areas such as outdoor rides, children play areas, riding areas and fishing grounds. Interestingly when vacationing to Dago Dream Park will feel optimal because here there are various facilities that spoil. Some facilities other than bus bandros in Dago Dream Park are large parking area, rest area, playground, musholla, toilets, where to eat, cafe and factory outlet. Places to eat or a restaurant that is presented by Dago Dream Park itself is a food truck concept with a variety of traditional menu serving. Being in Dago Dream Park area we will also feel comfortable because of the pine forests that cover almost the entire area. From the existing pine trees then the air in Dago Dream Park will feel more cool. To enter Dago Dream Park tour you need to set aside Rp 20.000. This tariff itself does not include the tariff to enjoy the game rides that have different prices. For those who are interested to visit Dago Dream Park then you have to Jalan Dago Giri KM 2.2 Mekarwangi village, subdistrict of Lembang, West Bandung regency, West Java. Well to get to the location of Dago Dream Park you can use public transportation or private vehicles. But in order to get comfort and flexibility then the choice of personal use is an option that must be selected. This is because when using a public vehicle usually makes you have to want to wait for the arrival of cars and customs ngetem. In addition, the state of public vehicles that are not good and crowded also makes the comfort level decreases. From here then the choice of using a private vehicle will be the right thing for you who want comfort while on vacation to Dago Dream Park. But what if it is not possible to bring a vehicle because of a long trip? Do not worry there is a solution that you can apply the rental car Bandung. With Bandung car rental will indeed make you able to vacation freely and comfortably because like bringing your own personal car. Well if you are interested to vacation by using a rental car Bandung then you can make Dirgantara Car Rental as a reference. With all the experience and professionalism then Dirgantara Car Rental will be able to make your vacation to Dago Dream Park become more exciting and fun. Do you who want to enjoy Bandung with a new atmosphere? Then you must come to Teras Cihampelas Bandung located at Jalan Cihampelas No.123-131, Cipaganti, Coblong, Bandung. Cihampelas Terrace is quite a new tourist destination in the city of Bandung flower. Inaugurated at the beginning of January 2017, Cihampelas Terrace become a tourist attraction that will give the long lasting impression on every visitor. Using the concept of Instagramable, making Cihampelas Terrace or also called Skywalk Cihampelas Bandung more interesting to be captured with camera. While here we will indeed find the colors of some icons and buildings that are up to be qualified as a photo background. No doubt when then Terrace Cihampelas often decorate your smartphone screen when opening social media. With funds reaching Rp 48 Billion, Cihampelas Terrace development was initiated by Bandung City Government within 3 months. 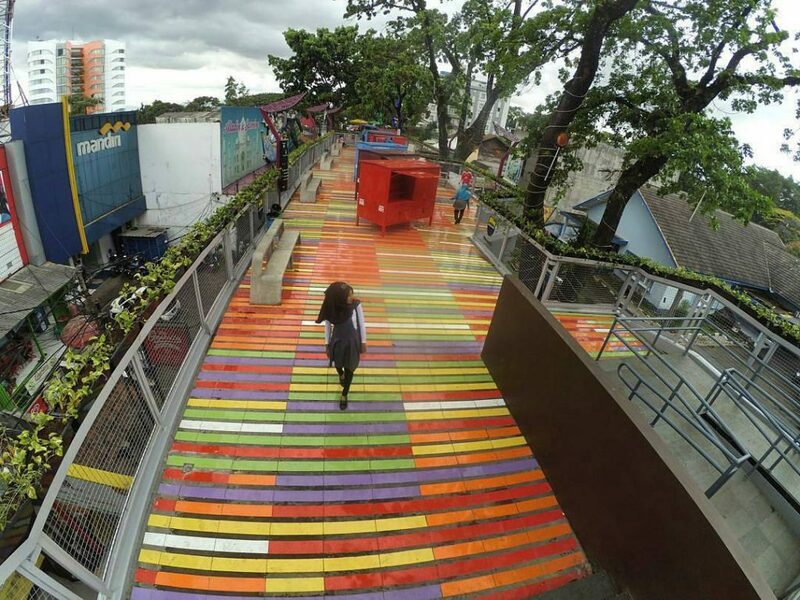 The construction of Cihampelas Terrace is a breakthrough by Ridwan Kamil as the mayor of Bandung with the aim to overcome the problem of jams that often occur in Cihampelas Bandung street. Before it was built, Cihampelas Highway area is a congestion area because of the many street vendors selling by the roadside. But since there is Cihampelas Terrace then the street vendors are relocated up on the pedestrian path. From here the existence of Cihampelas Terrace will be equally beneficial for traders and also pedestrians. This is because the pedestrians who pass the path Cihampelas Terrace have a chance to buy goods sold by traders. Especially with the concept of Causeway Cihampelas the Instagramable make this location more popular by the tourists. Cihampelas Terrace itself has a height of 4.6 meters from the Cihampelas Highway and 450 meters long and 9 meters wide. With the presence of Cihampelas Terrace itself Indonesia also has a skywalk official. Skywalk Cihampelas Bandung is the only skywalk in Indonesia and even the second skywalk in the world after the city of New York. Terrace Cihampelas built from the Adventist Hospital to Promenade Hotel now has become a new tourist destination in Bandung is popular especially by young children. Here we can enjoy a variety of exciting activities such as shopping knick-knacks, berkuliner or just enjoy the view of the city of Bandung to take pictures. At least there are 192 street hawkers who will pamper you with various merchandise and also culinary typical of Bandung. Do not forget also the affordable prices that you can get in this Cihampelas Terrace. While walking on the Terrace Cihampelas we will not be made hot. This is because along the road there are shady and green trees that make us feel the cool and comfortable air. Not only that in this Terrace Cihampelas our tourism activities will also be optimal with the support of several public facilities complete such as musholla, toilets, post security guards and elevators for people with disabilities. To go to this Terrace Cihampelas you can ride private vehicle or public transportation. If you choose a public transport then you can ride public transportation or public transportation Cicaheum-Ciroyom, St Hall-Lembang, Cisitu-Tegalega, Kalapa-Ledeng. Another transport you can use to get to Cihampelas Terrace is by taxi. But for you who want a comfort and convenience then using a private vehicle will be the right option. But if you leave from a location far from the city of Bandung and does not allow to bring a private vehicle hence rent a vehicle will be the solution. With Bandung car rental is then you can to Terrace Cihampelas with comfort and flexibility such as using a private vehicle. In Bandung itself has many parties who serve car rental services. So you will not trouble to embed a Bandung car rental. But the number of parties serving the rental car service in Bandung today makes you have to be selective. This is because it is not impossible there are persons who can harm you with unprofessional services. Well you who want to get a professional car rental services Bandung can make aerospace car rental as a reference. With all the experience you have, the aerospace car rental will make your holiday to Terrace Cihampelas more exciting and fun. Rafting has become a popular activity. Although challenging adrenaline, but it is this activity that is sought and eagerly awaited. By riding a rubber boat with friends or family along the rushing river makes many interesting things and experiences to be gained. Not only that in rafting activity itself there are benefits that can be obtained that physical exercise that can nourish the body and also the team in the boat kekompakan in conquering river rapids. Because of the benefits that can create this cohesiveness then rafting or rafting is often the choice of leaders in agencies, organizations and companies for the vacation event members as well as strengthen the team. Well if you are looking for rafting location in Bandung then rafting Pangalengan can be the right choice. Why Rafting Pangalengan? For rafting or rafting in the area of ​​Pangalengan, South Bandung has many advantages. The first advantage of Pangalengan rafting is its location which is in the Palayangan River with Grade III + or Grade III status. With a long journey to reach ± ​​4.5 KM, rafting on the River Palayangan in Pangalengan area can be reached within about 2 hours. In the course of rafting here we will find at least 14 rapids that challenge adrenaline. Among the 14 existing rapids there are several rapids in the form of mini waterfalls. From here it will make the experience of rafting here more impressive. Not to mention when the rain then will make the river flow becomes more rapid and more make the atmosphere more challenging rafting. Although many challenges to be faced in this rafting, but for the security need not be feared because along the path there is a rescue team that will help if participants find it difficult. All security equipment such as buoys and helmets are available and become the standard that should be used. Even before doing the rafting, the participants will be given instructions and guides to do the rafting well and fun. Interestingly Rafting Pangalengan in Palayangan River is not constrained by time due to the flow of river water that remains stable without the season affected. From here you can come and do Rafting in Palayangan River anytime. In addition to having several different levels of rapids, doing rafting in Pangalengan this will make us fascinated. This is because the pangalengan area has a stunning natural scenery and so soothing eye. From the expanse of pine trees and other green vegetation will spoil us along the rafting trip. From here then while doing rafting, you can also perpetuate the excitement and scenery with the camera that will produce cool pictures. Do not forget also the fresh air and pollution free that we can enjoy in this River Palayangan. With all that is presented Rafting Pangalengan this will make all saturated and tired immediately disappear instantly. Because here there are many operators who serve the activities of rafting or rafting then you must be smart to choose the best rafting operator who has professional and experience. See also the facilities and services provided by the operator. Compare with the price offered. In Rafting Pangalengan tour itself is not only rafting activities that you can follow. For some rafting operators there are also offers packages of other outdoor activities such as flying fox, paintball, ATV and some games that can strengthen the cohesiveness of the team. If all the things you already compare then you can be ready to plan a vacation and a trip to Rafting Pangalengan with family, friends or members of the organization in your agency. To be free when heading to Pangalengan area in South Bandung, you can make Dirgantara Car Rental as Bandung car rental solution. By renting a car in Dirgantara Car Rental a professional then you will be able to enjoy Rafting tours in the River Palayangan with the maximum. Especially with the fleet owned Dirgantara Car Rental rental which is Toyota Hiace to make you can bring all family members or your intansi in one car. Challenge Yourself at Hammocking Citatah! Hammocking is a relaxing activity in a swing made by spreading the fabric between two trees. After the cloth is stretched then we can relax and swing or lie in the hammocking under the shade tree. But in Cliff Masigit, Citatah, Padalarang, Bandung we will find a different hammocking than usual. Because if generally hammocking stretched between two trees, but in Citatah this hamocking will be spread to two two karst cliffs beneath is a cliff. From the state of Hammocking Citatah that as mentioned will certainly make guts and adrenaline is very challenged. How not the sensation of creeping into the middle of the hammocks that are under the ravine and relax at an altitude of 100 meters will make the adrenaline immediately spurred. Not to mention the gusts of wind that came to make the heart beat will be more unknown. But because the Citatah Hammocking is in the karst cliffs (limestone) towering so here we can enjoy the exotic landscape of cliffs and rice fields and hills. Not to mention the cool air of the plateau, making the leisure and relaxation activities in Hammocking Citatah increasingly felt optimal. While in Hammocking Citatah we can also see the view of Stone Garden and also the miners of lime and some residents who move in the countryside. From some of the natural charm then when you already feel comfortable in hammocking then we will feel relaxed and make all saturated and tired immediately disappeared. Although it appears dangerous because the location is above the altitude, but you do not have to worry because Hammocking Citatah has been tested with a qualified security completeness. So to do hammocking here we do not need to bring outdoor equipment because it has been provided by the operator or a local tourism provider. So you just have to come here and follow the instructions of a professional instructor to do hammocking above this height. In Tebing Masigit Bandung we can try some hammocking places that have a height of 100-150 meters. Three main cliffs that you can choose to be a hammocking location is Citatah 48, Citatah 90, and Citatah 125. Because the location of Hammocking Citatah is on a cliff then before you can enjoy it, we have to do trekking climbing cliffs that slippery and full of shrubs . Trekking trip climbing over this cliff usually takes about 10-15 minutes. The best time to come to Hammocking Citatah is in the morning or late afternoon. In addition to the air that is not hot, in the morning or afternoon we can also find a sunrise and sunset dish is beautiful and stunning. Do not forget also to bring the camera when here because photo activity here will be able to produce a cool picture and Instagramable. To be able to increase the hammocking at the top of this Masigit you have to prepare funds around Rp. 250,000. Hammocking Citatah location is located in the cliffs Masigit, Citatah Karst Area, Mount Hawu, Padalarang, West Bandung. The trip to Hammocking Citatah itself you can travel with two-wheeled vehicles or four wheels. But if you use a four-wheeled vehicle then you can not go any further. Meanwhile, when you come with a two-wheeled vehicle then you can go closer to the cliff. But because before entering the area of ​​Mount Hawu this road is not paved and dusty then you who bring the motor must wear a mask. On the road before arriving in the karst Citatah area you also have to be careful because many large trucks carrying limestone passing muddy mining results. To be more comfortable and comfortable trip to Hammocking Citatah this you can use a car rental in Bandung. And reliable car rental that you can choose to vacation to Bandung, especially to Hammocking Citatah this is Dirgantara Car Rental. By choosing Dirgantara Car Rental will make you have a choice of qualified vehicles such as van rental. With this van rental in Bandung you can invite all family or friends to enjoy Hammocking Citatah tour.